Forex Strategy Builder Professional is the leading software platform for generating and analyzing advanced MetaTrader strategies. It provides an easy way to build forex strategies by combining various technical indicators, and enables users to create Expert Advisors (EA) that act at several levels -- by using logical groups for the trading rules. Forex Strategy Builder uses a Strategy Generator that creates 1000's of strategies per hour. The best strategies are automtically added to a 'Collection', where they can later be filtered (using a variety of different metrics), refined, back-tested and re-optimized to achieve the best statistics. Once you are satisfied with the results, the source code (*.mq4) for each strategy can be exported as stand-alone Expert Advisor (EA) to be used in the MetaTrader trading platform. Portfolio Maker is an inexpensive ($49 USD) tool that can greatly simplify your your trading and testing workflow. 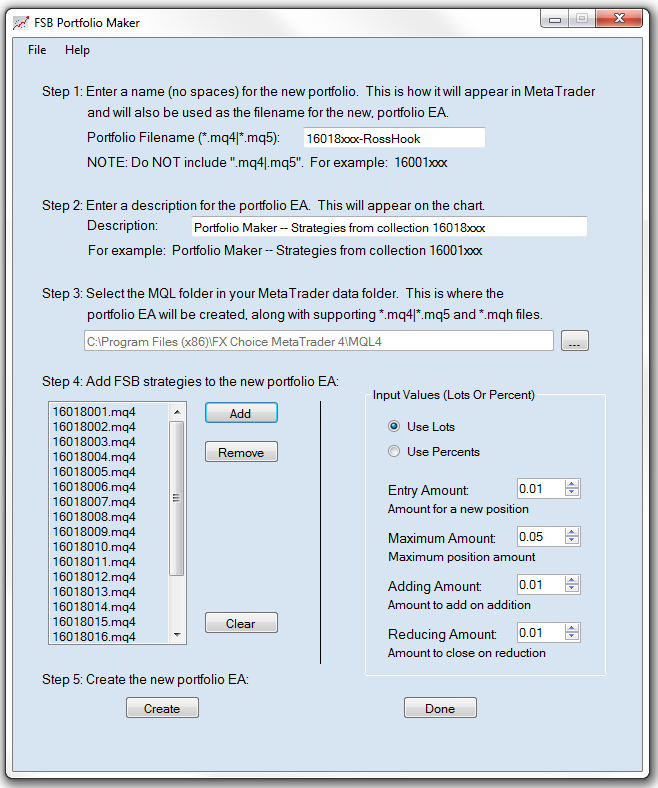 By combining dozens of FSB-generated strategies into a single, portfolio EA it now becomes possible to test all of them at the same time using Strategy Tester (and analyze the results using MT4 Tracker) or in a Demo Account. And when you are ready to go live, you no longer have to manually open dozens of charts and attach each strategy individually -- open one chart and attach the portfolio EA. For help with using Portfolio Maker, please refer to the online documentation. The 'Buy Now' button below will take you to a secure checkout. When the transaction completes a message will be sent to your email address with download instructions and a license key. After installing the application, the first time you launch the program it will prompt for the license key. The license key is stored on your machine so that subsequent launches will not require that you again input the license key.